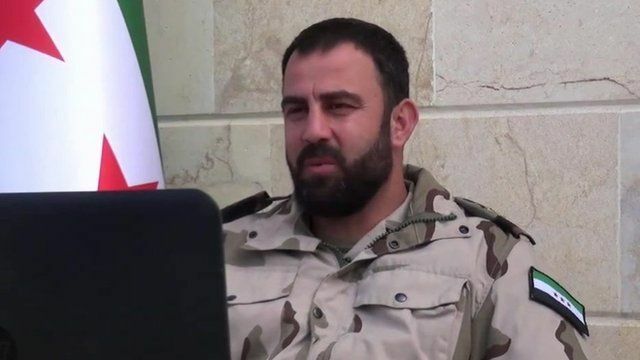 Syrian rebels: 'The West has abandoned us' Jump to media player A senior Syrian rebel commander inside Aleppo tells the BBC that his fighters felt abandoned by countries such as Britain and the United States. Inside the camp home to 11,500 Syrians Jump to media player The number of Syrians trying to cross into Turkey amid an upsurge of fighting in northern Syria continues to rise. Doctor 'under siege' in Aleppo Jump to media player Hamza Alkhatab, a doctor in one of the hospitals in a rebel held area of Aleppo, describes the difficult conditions in the city. Thousands of refugees left in limbo Jump to media player Thousands of Syrian refugees are trapped at a border crossing with Turkey after they fled from Syria's second city Aleppo. Some 50,000 people have fled the recent fighting in northern Syria, according to the Red Cross who say there is an urgent need for deliveries of food, water and medicine. Backed by Russian airstrikes Syrian government forces are gaining ground near Aleppo with only a few towns remaining in rebel hands. A senior rebel commander inside Aleppo says his fighters felt abandoned by countries such as Britain and the United States. The BBC's Quentin Sommerville reports.